Brian Pollard is acknowledged as one of the most popular naive painters in the South West of England. His seascapes of Devon and Cornwall are instantly recognisable, with hot air balloons and fluffy white clouds drifting across cerulean blue skies, while yachts and fishing boats traverse a rhythmic sea below. 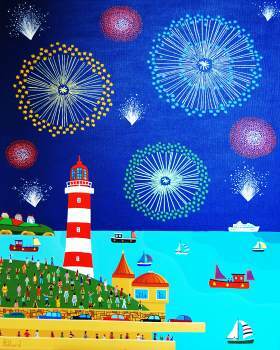 Brian's paintings of Plymouth landmarks such as Smeaton's Tower and the Dolphin pub have been immortalised in a series of prints and cards. Over the years his images have achieved a global reputation, being used successfully in cards, calendars and jigsaws throughout the UK and as far away as China and Japan. Brian is a member of The Association of British Naive Artists.